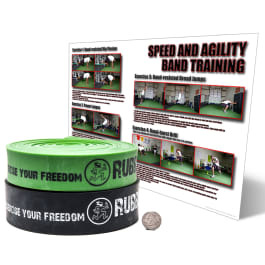 The floss compression band is an essential performance tool and should be a staple in the gym bag of every athlete looking to improve range, restore joint mechanics, or unstick matted down or previously injured tissue. Compression tack and flossing (compression "flossing") works on many levels; including re-perfusing tissues that have become stiff or gone cold after injury, and by compressing swelling out of tissues and joints. It is simply a neurophysiological response. Beyond occlusion-- what is happening is a forced gliding of the myofascial structures. With conventional soft tissue mobilization and manual therapies tissue displacement compromises effectiveness; with tack and flossing the compression forces tissue adhesions to slide against each other with minimal tissue displacement. This forced glide not only resolves myofascial dysfunction due to aberrant tissue formation, but also indirectly (or very directly depending on the therapist's intent) acts as an effective neurodynamic tensioner technique. The increase of ROM is not only driven by inhibition of tonus, but also by increased neural drive. Because the floss band can be used while actually performing the movement the athlete is trying to change, its effect on sliding surface and restoration and tissue mobilization is unmatched. Floss Bands help make positive subjective changes to our joints and soft tissues through compression, tension, and movement. This doesn't cure inflammation based injuries like tendinitis or prevent all forms of it from ever bothering you again. 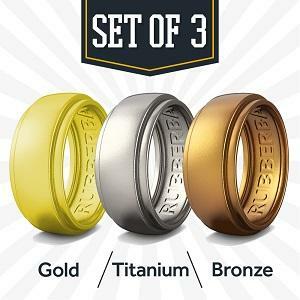 However, it does provide some relief and allow you to continue training. Any time you are suffering from inflammation based problems like tendinitis or bursitis there is something you are doing that is causing the problem. Until you deal with that, you will be forced to repeat the triage over and over. Essentially, what's happening is that the constriction prevents further inflammation of joints and connective tissue, as well as constricting blood flow for a bit. Once the compression band is removed, the blood flows back into the area. For joints with large amounts of connective tissue, such as elbows and knees, this allows the blood to flush away some of the excess white blood cells that are further making the inflamed area worse. Please Note: If you actually tore a ligament, sprained a joint, etc., you need to see a doctor. Usually, rehab involves staying off the injured limb during the healing process, and re-initializing work with low weight high reps to strengthen the connective tissue and get the blood flowing through the joint until it is completely healthy again. The floss band isn't going to make you stronger; however, it does change the way the muscles orient themselves when you are doing various different movements. What that means is you can intensify the movement using the compression band. Again, when you take the floss off, you have that rush of blood into the mobilized area. The best bet is the rush of blood helps recovery. For a limited time, your muscles may be a little larger similar to a bodybuilder pump, but that effect is strictly due to the extra blood post mobility work. The band is compressing, if you feel like your blood is being occluded too much, your limbs are turning purple or faint, or you have numbness/tingling… please stop using immediately. Can leave marks: The positive mobility effects of flossing outweigh any compression and discomfort that you may experience with this level of compression, but it’s worth noting that the bands can leave the occasional line or mark on your skin, depending on how your wrap your joints. They’ll go away, but you could be left with a few temporary battle scars. The Floss can be used really at any time, warm up, cool down, and in between workouts. If you have varying levels of inflammation, especially in your joints (elbows, knees, and shoulders), you’ll be amazed at how much relief the bands can provide in just a few minutes. After using the bands, you can have dramatic “test and retest” before and after results that get you back to training or finally rehabbing from a nagging minor injury. Also, a flossing session only takes a few active minutes, so it’s very minimal commitment for fast results. These flexible bands have no problems wrapping around most joints on your arms and legs. If you’re experiencing discomfort in your knees, shoulders, elbows, ankles, or even wrists, it’s easy to work on these joints using the floss. The bands won’t replace your foam roller for your back and between your shoulders, but they’re very effective at releasing crepitus and impingement in your arms and legs. 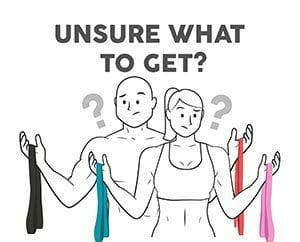 To work shoulders, wrists, ankles, elbows and the little pieces within, wrap a band tightly around the joint (sometimes it might take two bands to cover the area) and put it through ROM like push-ups, PVC pass-throughs, squatting, lunging, etc. For knees, wrap one band above and one band below the joint, then do some squats. When you put the joint through ROM with bands anchored on either side, they stretch everything in between, which can greatly improve not only joint ROM but also pain, stiffness, and tendonitis. Wrap the compression band starting midfoot working up over the ankle, then move the ankle thru its full range. This can be done actively by pointing your toes and then bring them back up as far as you can. I like to perform my ankle mobility lunging with the compression bands on. Take the band off immediately. The purpose of compressing is to mobilize, not demobilize. And that’s what will happen if you keep the band on for too long. 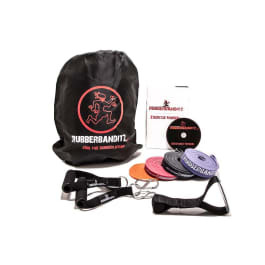 To add a floss compression band to your gym bag essentials, check out all the great options that Rubberbanditz has to offer.